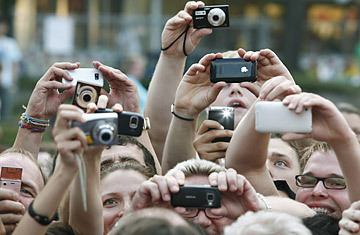 Fans use their cameras and mobile phones, including iPhones, to try to catch pictures of Tom Cruise and Cameron Diaz (both unseen) arriving on the red carpet for the premiere of their film Knight and Day on July 21, 2010 in Munich. In many respects, the digital camera I bought last year is a profoundly mediocre photographic instrument. Taking pictures feels like a crapshoot: Some come out beautifully, but others are drab and fuzzy. There's no optical zoom, and the digital one, like all digital zooms, isn't good for anything except making photos look grainier. And the puny, pulsating flash can make anyone look like a corpse bathed in the glow of a neon sign. And yet...I enjoy this camera so much I take it just about everywhere but into the shower. I share nearly every photo I take with it. It's a delight to own and use. In case you haven't guessed yet, the camera in question is an iPhone 4. Its pros and cons as a picture-taking device neatly summarize the strange state of affairs in the world of photography. When it comes to image quality, digital cameras of the traditional, non-phone sort are still the runaway winners. But the most interesting cameras, the most entertaining cameras  maybe even the most useful cameras  are camera phones. This is a recent development. Camera phones have been around for more than a decade, but it took them years to cross the all-important demarcation line from "bad" to "not bad." In 2005 or thereabouts, I forgot my point-and-shoot during a trip to Universal Studios Florida and tried to make do with the camera on my Treo 650; the results were so icky that I was sorry I bothered. By contrast, the iPhone 4 and other top-notch modern smart phones can produce surprisingly decent results  at least if you've got plenty of natural light, a steady hand, and a subject that's no more than a few feet from you. I wouldn't want to print most camera-phone photos and pass them down to my descendants, but they get the job done for more casual preserving and sharing of memories. Along the way, phones have gained other features that intertwine with their photographic capabilities in powerful ways. 3G wireless enables them to upload images to the Internet swiftly; GPS lets them to tag pictures with the location where they were shot. Most important, smart phones such as iPhones and Android handsets run an ever-expanding array of photo-related applications. Last fall, for example, an iPhone snapshot-sharing app called Instagram debuted. It doesn't do much except you share pictures which it's processed to look like you snapped them with a few decades ago, but it's so fast and fun that a million users signed up in the first ten weeks. So how about traditional cameras  the kind that don't also let you call your grandma, browse the Web, wrangle e-mail, read e-books, and play Ms. Pac-Man? They're evolving, too. As in the past, though, most of the evolution is in the service of higher-quality pictures. Canon's PowerShot S95, for instance, might be the most outstanding pocket-sized point-and-shoot of the moment, but its excellence comes largely from its larger-than-usual sensor, serious lens, and sophisticated image-processing technologies. When it comes time to get photos out of the S95 and onto the Web, you'll most likely connect it to a PC via USB cable or plug its memory card into a computer's card reader  exactly as you would have done with the digital cameras of the 1990s. I keep coming back to a vision of the camera I really want: an iPhone 4 that's also a PowerShot S95 (or, if you prefer, a PowerShot S95 that's also an iPhone 4). I fear that asking for such a device may be an exercise in cluelessness, like demanding that the car industry build a sporty coupe with room for six passengers and a week's worth of luggage. Then again, electronics companies have a pretty impressive track record of coming up with devices that didn't seem possible  it just takes longer, sometimes, than we impatient, unreasonable consumers would like. How does 2015 sound as a target for the camera phone/phone camera of my dreams? McCracken blogs about personal technology at Technologizer, which he founded in 2008 after nearly two decades as a tech journalist. His column for TIME.com, also called Technologizer, appears every Thursday.